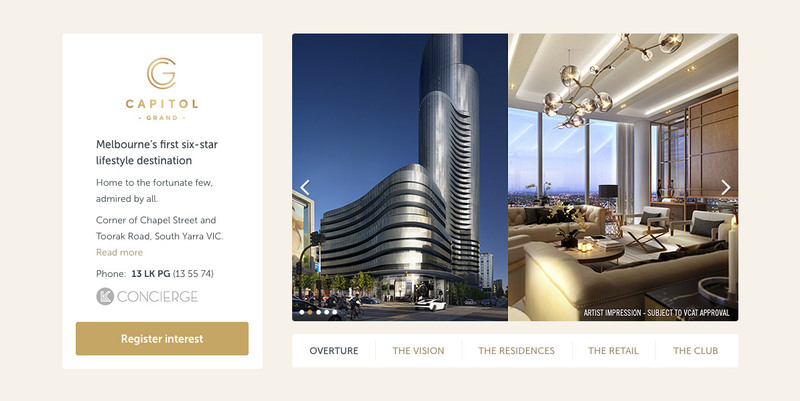 This project centred around creating a native advertising placement on the realestate.com.au homepage. An external property developer expressed interest to advertise their new property development on our site, seeking maximum exposure. We set out to design an interactive homepage placement that showcased the development, while still presenting as ‘house’ content to our consumers. It was important that the placement did not alienate our regular homepage users, or appear simply as a large banner ad. During the course of this project, I produced multiple concepts and design executions for the placement. I worked closely with the lead designer ensuring our ‘house style’ was maintained and evident in the concepts. I presented the designs to the wider project team, including sales staff and product managers from other lines-of-business. An important responsibility was the acceptance and processing of in-house and client feedback. After our initial design was signed off, I worked with product managers and creative staff in other lines-of-business to ensure the build phase and ultimate delivery was on-brand and true to the spirit of our concept. The homepage placement was launched on-time and on-budget in early March 2015. Early statistical reporting on the lead generation of this placement has been very positive, more information will be available toward the end of the campaign. NB: The second image below shows the placement in-situ, and also showcases additional concept work completed as part of a short-term homepage uplift project.